The following article was written by Connie Kuhns as part of a series of articles about filmmakers coming to the Salt Spring Film Festival on March 3-5, 2017. Filmmaker Roger Williams will be attending the festival and leading a discussion about the film following the screening. The Filmmaker series is sponsored by Stonehouse Bed and Breakfast. They say a person can predict the subtle hues of next year’s fashion season by the colours of the water in China’s rivers. This is particularly true in Xintang, where the indigo dyes and chemical waste from the manufacturing of blue jeans pour into the Pearl River. China is the clothing factory of the world, followed closely by Bangladesh, India and Indonesia. As a result, the majority of the magnificent rivers flowing through these countries are sick and dying, as are the people who live and work along the river banks. The fashion industry has become the second biggest polluter on the planet. The documentary RiverBlue, screening at this year’s Salt Spring Island Film Festival, is the story of this destruction. 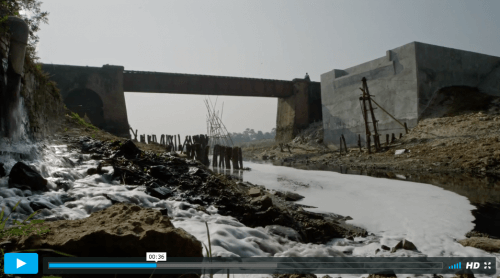 Cinematically stunning and told from the point of view of international river advocate Mark Angelo, along with activists, reporters, environmental lawyers, and sustainable fashion designers, this film leaves nothing to the imagination. “We had researched some of the harmful effects of clothing manufacturing” said Roger Williams, producer and co-director of the Canadian documentary, in an email conversation with this writer, “but you really don’t get a sense of the scope and scale of the destruction until you travel through these areas. What really floored our group were the smells. Hazaribag, Bangladesh was probably the most concentrated area and the smells were incredibly toxic, similar to the smell of turpentine. As soon as we got out of the vehicle, it just hit you”. The film crew traveled for over three years to 23 different locations in 11 countries. They filmed the young workers in the tanneries in Bangladesh and India standing in toxic chemicals without shoes, their bodies becoming conduits for new kinds of cancer and disease. They also filmed the human pollution of the Ganges and its tributary river the Yamuna, where the open defecation of 600 million people, especially during religious pilgrimages has killed these river goddesses. But the Citarum River in Jakarta is the most polluted in the world, a combination of human waste and the 500 textile factories along 200 miles of river bank. RiverBlue documents it all. For the filmmakers, what they witnessed could have been overwhelming. “Mark Angelo is an incredibly hopeful individual, and I did question him on this as well, since some areas truly do look beyond hopeless” says Williams. “Mark always reminded us that just like the River Thames, we can turn things around. If we as a society want to help make changes, we will make them happen. Rivers can be very resilient, and if we give them a helping hand, they can come back to health. We found and worked with Riverkeepers around the world who also gave us great pause, as they know the full the extent of the damage to their local rivers. This also gave our group great hope, sanity and the ability to push through the things we had to, so that we could tell this story”. It wasn’t always this way. There was a time in recent history when clothes were made closer to home, when blue jean production in China was a small mom and pop enterprise. From the 1960s until the signing of the North American Free Trade Agreement, El Paso, Texas was the blue jean capital of the world, producing two million of pairs of jeans per week in their factories under much stricter environmental protection laws. From Texas, the jobs went to Mexico and then on to China. In the film, shots of empty warehouses in this Texas town in combination with the putrid rivers and squalid working conditions in parts of Southeast Asia make the point about unexamined consequences. “The way that the large brands have created their own infrastructure to contract out or outsource their production, is a very clever way to outsource their risk and their environmental problems”, says Williams. “I believe these corporations realized this around the time that NAFTA was signed, and this gave the brands a new business model to find the cheapest labour. I don’t think the environmental impact was considered at this point and I don’t think there was much concern for the bi-product of outsourcing. They were just looking for the cheapest way that they could manufacture their product so that they could maximize their shareholder value”. But RiverBlue also introduces the new designers, entrepreneurs, and inventors (including the creator of the original stone-washed jean) who are developing very innovative ways to make textile production safe for the workers and the rivers. “El Paso and the work with NAFTA was, for me, a real turning point in our journey and very illuminating, especially now with what is going on in the US. I think we hit on something that can have a positive impact in terms of new technology for manufacturing. The point that Lukus Eichmann (co-founder of California-based ECO-PRK and Tortoise Jeans) and others made, is that it is expensive to refurbish a factory, but you can use new technology to build a more sustainable factory, using processes (like those invented by companies) Italdenim and Jeanologia that reduce or eliminate chemicals and conserve water usage and actually create a more sustainable and profitable industry. “I do believe that manufacturing that is being done locally will lead the way for bigger brands, as these young hip designers are trying to build a new economy and a new way of providing clothing. Currently, they are the early adopters of the industry, and once they prove that they have a growing market, others will follow”. As Williams points out, the consumer does have the last word, (and this doesn’t mean harassing the sales associate at the Gap). “These large manufacturers will listen when enough people start asking them how their clothes are made. Consumers really do have the power, and they can vote with their dollar. When that starts to happen, brands will change quickly. The consumer does have the choice and they do have a voice. I believe that the manufacturers that do make this change will ultimately be the manufacturers who survive in business. I also believe that like the organic food movement, which took 20 years to become cost effective and of importance for the consumer, the fashion industry will go through the same process. I guess we are building a movement. As filmmakers, we have said from the start we wanted to be an agent for change with RiverBlue”. With a strong narrative, dramatic imagery and insider filming, RiverBlue is a powerful expose connecting the death of the world’s rivers to our fashion industry. It also succeeds as a call to action with the added bonus of showing actual solutions and giving power to the people. For more information on sustainable fashion visit this website. Learn more about the film and the festival.